Buying property abroad comes with the additional challenges of an unfamiliar legal system and language barriers. Buying property in Ibiza is more challenging still. Demand and values are unique to the Island and the market will not necessarily reflect general economic trends affecting Spain nationally. A very serious business indeed, and one where the clever money will see the benefit of putting your financial interests in the hands of a specialist. 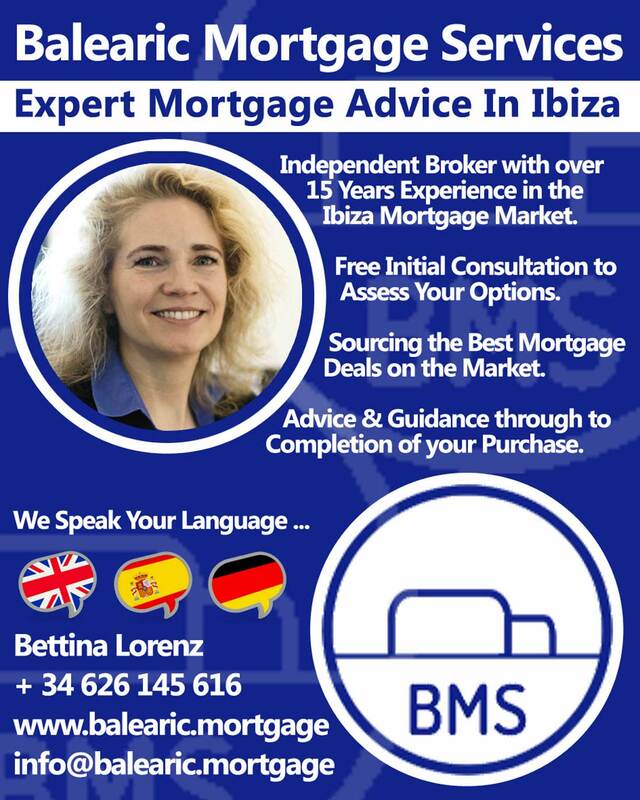 Bettina Lorenz of Balearic Mortgage Services knows the Ibizan property market better than most. 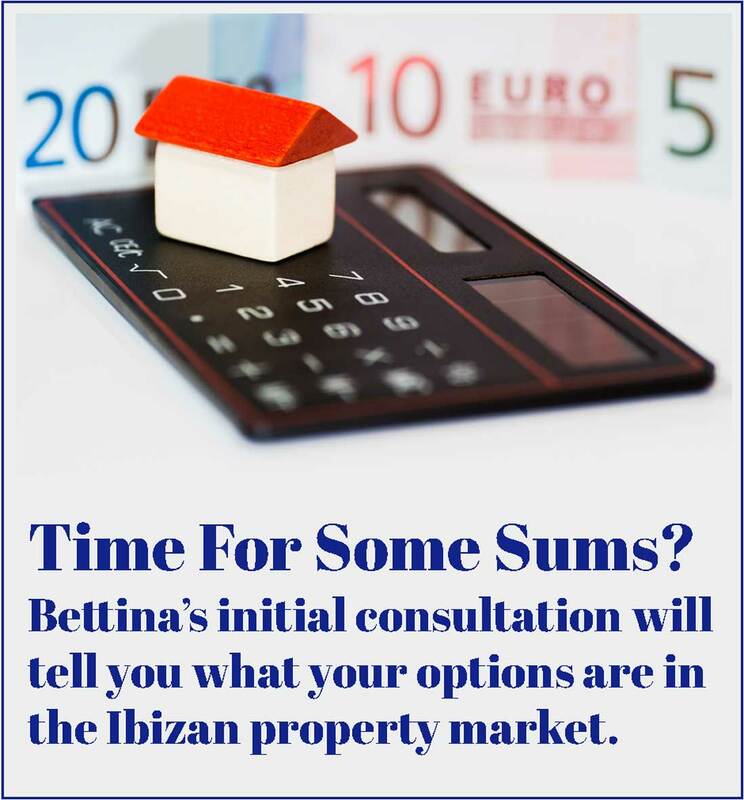 Here she gives the benefit of her 15 years experience in addressing some of the most important factors for anybody looking to buy property in Ibiza. 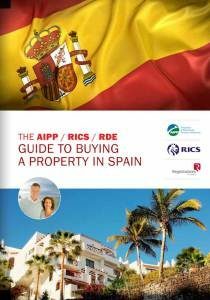 At the foot of the article you will find the Royal Institute of Chartered Surveyors Guide to Buying a Property in Spain. It can be viewed online or downloaded to read at your leisure. Are Spanish banks currently willing to lend? The Spanish banks are much more willing to lend now than they were during and immediately after the mortgage crisis. 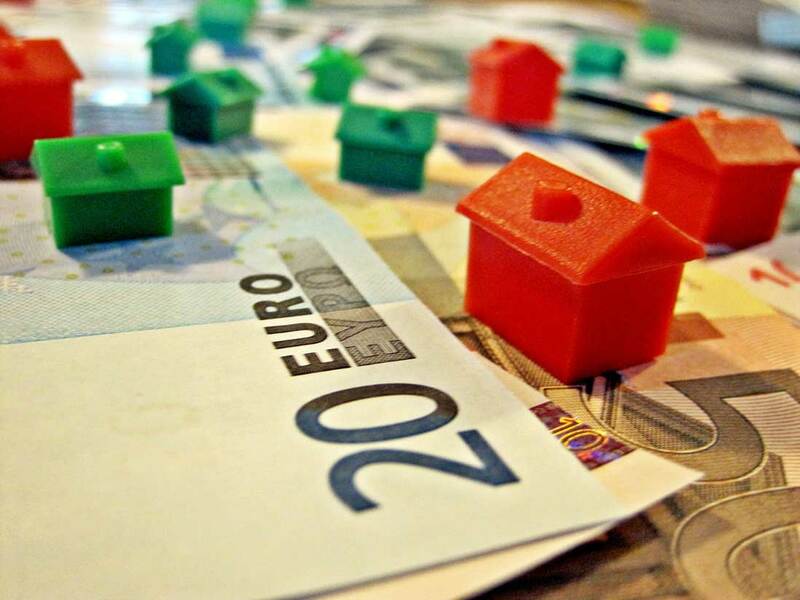 The Spanish mortgage market is actually very competitive., however the banks are still cautious about the non-resident clients they will lend to. 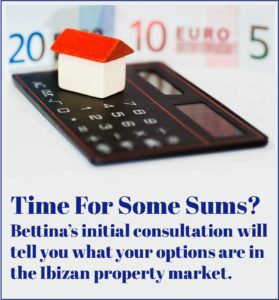 Generally speaking, the client needs to have a deposit amount of minimum 30-40% of the purchase price of the Ibiza property for sale, plus must also have further funds to cover the taxes and expenses involved in the purchase – I usually advise to calculate between 12-14% to cover these expenses. 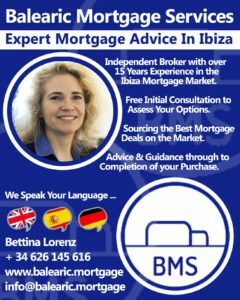 How easy is it to obtain a mortgage in Ibiza and what criteria must an applicant fulfil? 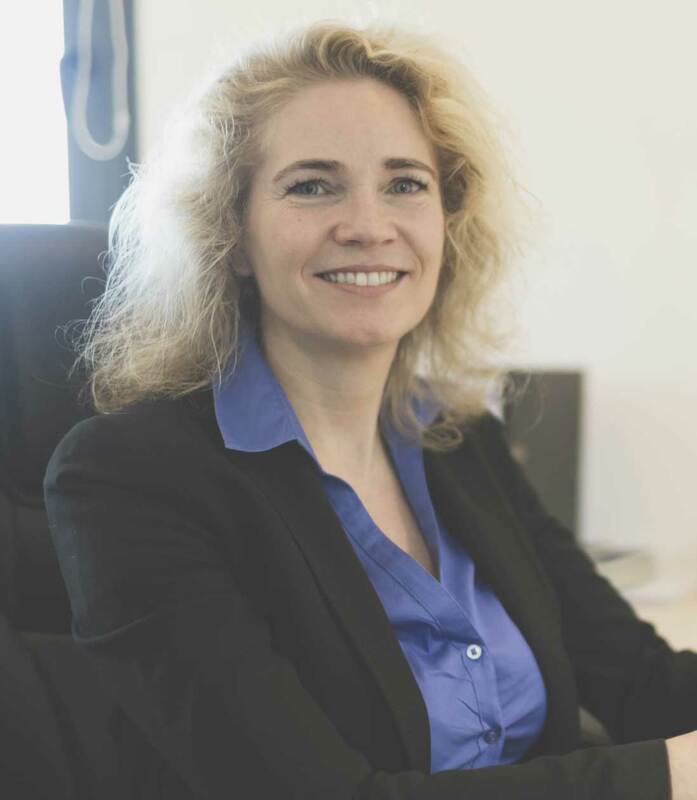 I would not say that it is particularly easy, especially if the client applies for a “no standard” mortgage, that could mean to buy a plot and construct their own house or to buy a property in name of a Spanish company. But I know which bank is helpful and willing to land for each purpose or requirement the client may have. Also the way that the application is presented is extremely important. I try to keep my client’s applications as simple as possible so that I ensure a quick approval from the lender. The Spanish banks offer fixed rate mortgages and variable rate mortgages and the client has to decide with my help which is the best option for him. There are no interest only options available now, but as the interest rates are actually very low and the euribor about one year is in negative, the monthly payment is tolerable. Will Brexit affect mortgages in Spain? Spanish Banks for many years have granted mortgages in Spain to most nationalities so technically UK residents should not be affected by the leave vote. As the biggest buyers of second homes in Spain it is difficult to imagine a situation where Brits are barred from owning one or being able to apply for a mortgage in Spain. The non-resident Spanish mortgage market currently is such that, only countries on the Bank of Spain watch list , which includes those countries where due diligence on affordability and for money laundering cannot be undertaken, find it impossible to get a Spanish mortgage, and the UK will certainly not fall into this category despite the referendum result. Where things may change is on the level of risk willingness and flexibility the Banks in Spain may face mortgage applications from a UK applicant. Spanish Banks may also look to increase pricing to reflect the higher risk they feel they are taking in granting a loan to someone living with so many unknown issues regarding to future laws and fiscal stability. I have spoken with the Spanish lenders and at present this is just speculation. The key impact on the terms and conditions for non EU residents is not getting 70% of the purchase price as a mortgage, and in consequence means that the banks look to keep loan to values at 65% or below for all new applicants who hold a UK passport. Although no Spanish bank at present have actually changed its terms and conditions as standard, they´re weighing up being more cautious at this point in time until the total situation on future legislation becomes clearer. Because the second key consideration for the Banks in Spain is that there is no clear view on what effect on the fiscal stability of the UK the vote will have. There is no way of knowing at this point whether the exit from Europe will have a long term positive or negative affect on the economy and if so to what level. Do you only organise mortgages on Ibiza? I occasionally arrange mortgages on the mainland and in the other Balearic Islands; however Ibiza is my target market. I recently signed a collaboration with an international bank in order to offer a wider range to my international clients. How has the Ibiza mortgage market developed this year? There has definitely been a positive evolution in the Ibiza mortgage market this year, both in the number of mortgage applications and also the amount that the clients are buying for. The real estate market is picking up in the Balearic Islands and in the first half of the year 4.679 home mortgages were signed, representing 25.2% more than in the same period last year. According to data published by the INE, in June 2016 have been established 1.061 mortgages in the Islands, 48.6% more than the same month last year. This means that the Balearic Islands is the third community with the highest rate of increase, behind Castilla-La Mancha and Catalonia and well above the 15.5% increase recorded state average. What would you highlight most about working at BMS and what is your day-by-day? As I am originally an utterly banker, now I really enjoy the privilege of working not only for one bank but for all the banks on the place and also international banks. This gives me much more satisfaction as I am really able to offer the best deal for my clients. Also to alternate the work in my home office with the visits of clients and spots is a big plus. 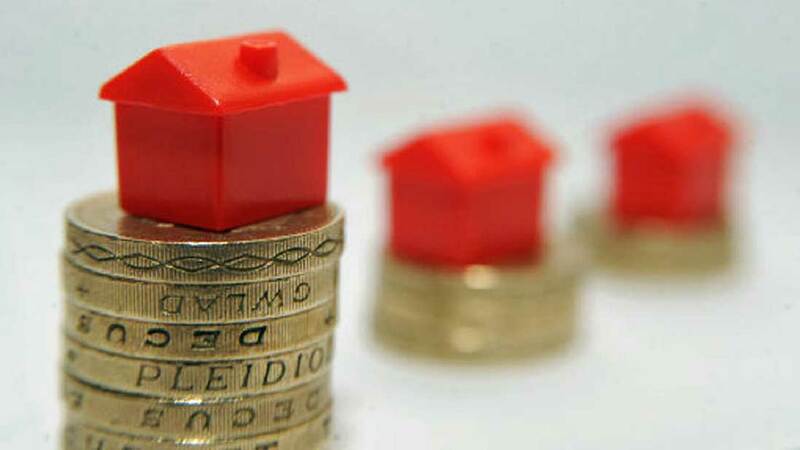 A typical day will involve speaking with several lenders, possibly meeting up with clients as well. Although sometimes I will not see the client until signing the mortgage because during the whole process we are in contact by email and over the phone. I normally spend about 2-3 hours speaking with the lenders and making public relations contacts with real estate agents which is very important for my job. For the other 4 to 5 hours working on emails and processing information received from clients. My work consists in finding out the personal situation of my clients first, then helping the banks to understand the application from my clients and after that finding out the best option for my clients as I know where best to place a client for the best result. As Reuters reported in April 2016 a Spanish court ruled that the country´s banks including leaders Banco Santander and Caixabank can no longer sell mortgages with so-called floor clauses. The court said banks had to repay customers what they had lost since May 2013, when Spain´s Supreme Court declared these mortgages, who’s rates cannot fall blow a benchmark, were invalid if they had not been presented clearly. As Bloomberg informed in July 2016 the Top EU court will rule the coming months on the Spanish mortgage case. Lenders including CaixaBank and Banco Popular have removed the limits in their mortgage contracts and have provisioned for legal risks linked to the possible elimination of the clauses. CaixaBank said in July it estimates it would have to provision an extra 750 million euros to cover for possible impacts if retroactivity is granted. It has already provisioned 515 million euros.